The President of the University receives a certificate of appreciation from ICVISP 2018 International Conference in the USA. The President of the University receives a certificate of appreciation from ICVISP 2018 International Conference in the USA The President of the University of Information Technology and Communications , Dr. Abbas Mohsen Al-Bakri,received a certificate of appreciation from the Second International Conference on Vision, Image Processing and Signal ICVISP 2018 held in Las Vegas, USA, from 27 to 29 July 2018. 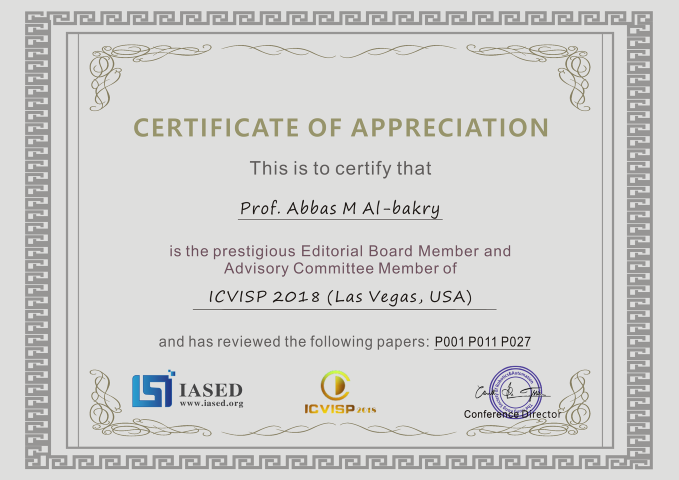 Albakry is a member of the Editorial Board and the Advisory Committee of the Conference, in addition to his evaluation of a number of researchs for the 2018 ICVISP International Conference held in the United States.